Hostland Review 2019: Is Hostland a Good Hosting? Hostland offers almost every imaginable hosting feature at a price that is far below what you will pay elsewhere. But it’s for Russian speakers only. Founded in 2003, Russian web hosting company Hostland has been offering services for more than ten years, during which time it has done business with more than 22,000 different companies and individuals including some owned by the Russian government. Unfortunately for foreigners, information and support are available only in Russian, but your web browser can have a good stab at translating their website into English. 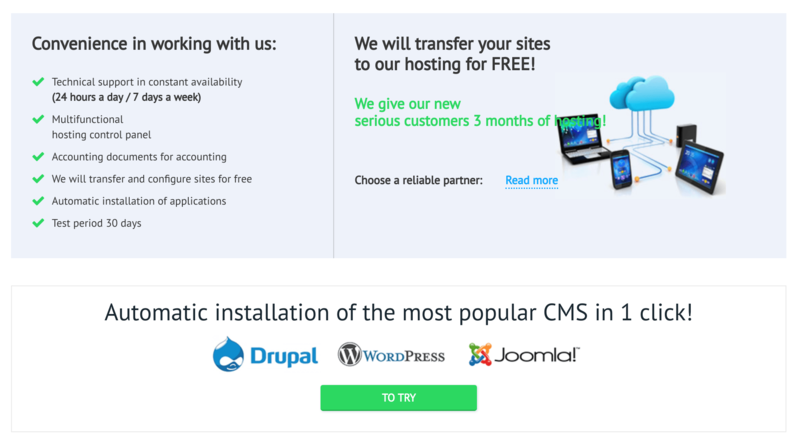 For beginner webmasters, Hostland also offers specific hosting options for many of the most popular content management systems including WordPress and Joomla. More advanced webmasters can take advantage of advanced scripting languages like Python or Apache server modules. Hostland offers very high performance and feature functionality at extremely low prices. Entry-level plans begin at some of the lowest prices you’ll find anywhere, despite the fact that you get 5 GB of SSD memory, a free SSL certificate, and the ability to host five sites. Moreover, you can take advantage of a special discount if you purchase a yearly plan, which lowers the price even further. Another excellent characteristic of Hostland’s shared server pricing is the gradual increase in price and the ratio of what you get for what you pay. On average, moving up a tier doubles performance but only increases prices by 70%, so the highest plan offers 40x the performance of the entry-level plan but at only 7x the cost. Advanced webmasters will want to take note of one drawback, though. The highest plan only offers 200 GB of storage space, which is well below the level at which many other services max out. Support options are excellent… if you speak Russian. Individual phone support lines are available in a number of Russian cities including Moscow and St. Petersburg, and I found the staff to be willing to answer questions quickly and thoroughly. Separate email addresses are offered for different types of support including technical questions, finance/billing, and customer service complaints, so I was able to get a detailed answer to any question. Skype call support is also available, which is rarely seen but is very useful if you want to make contact from your computer. Hostland offers comprehensive functionality for all webmasters, including CMS support for beginners and advanced scripting languages for those that need it. All at excellent prices. However, webmasters running extremely large sites may find they need more memory than is available here. Wondering how Hostland stacks up against other Web Hosting companies? Enter any other Web Hosting company and we will give you a side-by-side comparison.